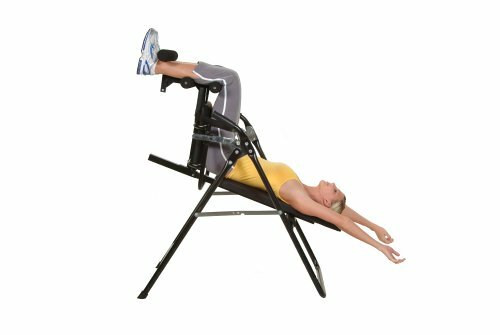 In the world of inversion therapy, the most widespread and well-known tool has for years been the inversion table. However, as the practice of flipping upside down is growing in popularity, new equipment which makes the process easier is constantly emerging. Most recently, inversion chairs have come under the spotlight for their ease of use and a straightforward design. Many pained by joint ailments who’re on a lookout for a less arduous mechanism will appreciate the simplicity and effortless use of an inversion chair. However, as with every other product, making the right purchase can prove quite troublesome. You need to think about a range of factors that come into play, and making the final decision can wear one out and be overwhelming, to say the least. Stick with us to find out what the best inversion chairs of this year are. Hopefully, this information will help you make an informed decision or at least nudge you in the right way. Inversion chairs come in two different types: models which convert into a structure resembling inversion tables and those which keep you seated for the entire duration of your inversion session. With the former, you’re able to invert to a full inversion angle while the latter provide enhanced ankle and knee support, making them ideal with those who are bound with mobility issues. We want what’s best for you. That’s why we spared no effort in trying to find the inversion chair that not only provides great comfort and efficiency but is also durable and long-lasting. What’s more, we wanted to make sure your safety is guaranteed and you can rest assured knowing the following products are also the safest options on the market. Truth be told, we can’t single out the best inversion chair that fits all people. In the end, what it all boils down to is your own preferences. You may prioritize safety features over durability but you may also place budget at the top of your most important considerations. To stay on the safe side, we’ve reviewed several products, each of which excels in its own domain. Let’s dive in and see which inversion chair is right for you. With its unique design allowing for simple use and effective inverting, Health Mark IV18600 Inversion Chair seized our top spot on the list. The ergonomically convenient structure of this inversion chair allows you to invert at an angle of up to 70 degrees and remain in a seated position throughout the process. This makes the IV18600 a great pick for those who value comfort and support above all; indubitably, this product is a fantastic choice for all mobility-impaired individuals out there. Anyone looking for gravity-assisted traction without the counter-effective joint pressure will be glad to see the padded ankle and knee support system at the front which Health Mark has put a lot of thought into. This clever design feature allows you to keep your knees bent and gain the full benefits of inversion whilst the weight load is evenly distributed. We'd like to see some sort of an ankle locking system here but it is unfortunately lacking. However, this is only a minor omission which doesn't really impede your safety or ease of use. The final great thing about the IV18600 Inversion Chair is the ability to set your preferred height, belt tightness, and inversion angle from the same spot, a handlebar which is within your arm's reach. Talk about simple configuration. Durability and comfort are seldom qualities which go hand in hand with inversion chairs, but Health Mark managed to blend them nicely within the design. We have thick, comfortable padding covering most of the components and a durable steel frame forming a backbone of what is an outstandingly constructed machine. The results? Unparalleled. An inversion chair which can withhold up to 300 lbs of weight while at the same time providing superb comfort. Priced relatively reasonably when compared to other products on this list, the Health Mark IV18600 Inversion Chair offers a sound investment. After all, what you're getting for an average price is a durable, convenient, and straightforward piece of equipment. We'd highly recommend you consider this product, especially if you're shackled by pain or are afflicted by limited mobility. The ability to easily use this inversion chair and configure its settings as you wish makes it a solid choice for beginners and intermediate users alike. From cushioned upholstery on the headrest to the rubber floor protectors on the bottom of the frame, Stamina has given the abundant features on this modern-looking inversion chair plenty of attention to detail. Constructed with comfort and effectiveness in mind, the Stamina Inline offers a variety of adjustments and is a fine piece of equipment across the board, well-deserving of our runner-up position. Let’s have a closer look. When it comes to adjustments, Stamina truly spared no effort in creating an inversion chair which fits all heights and body types. We have to single out the rarely-seen ratcheting leg lock system and the quick-adjust foot bar which can be easily changed to accommodate you perfectly, even when you're seated. All these moving components often take a toll on the chair's stability but this is not the case with the Inline. At worst, the assembly will be a little elaborate and slightly more time-consuming than usual. What's more, you're able to select the angle of your inversion by tightening or losing the adjustment strap underneath the seat. Finally, you can even alter the tightness of your lap belt, meaning you will remain fastened securely during your inversion regardless of your waist size. You won't have to worry about fragility of this inversion chair as its frame is constructed from durable steel which includes skid-resistant rubber to prevent your chair from jiggling and your floor from scratching. In addition, once your sweat breaks through you'll be happy to find padded handles on each side of the chair which provide decent grip and easy maneuvering. You can rest assured every point of contact between your body and the chair is padded for ultimate comfort. With all adjustment options and features the brand offers, it is sheer wonder the Inline inversion chair doesn't come with a heftier price tag. With that being said, we can conclude this product offers great value for money. 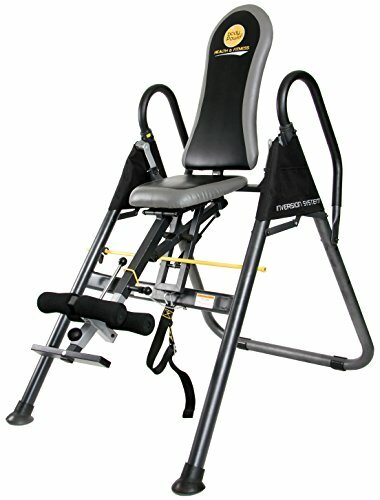 In a nutshell, Stamina Inline Inversion Chair provides some quite unique features which minimize the amount of effort needed to invert with full benefits. Equally important is the durable, comfortable structure of this model and its elegant design. Apart from the substandard weight limit and the lengthy assembly, you'll be hard-pressed to find a flaw in this inversion chair. The Body Power IT9910 is set to grab your attention if you’re plagued by back pain, mobility issues, or are simply in the market for a secure and easy-to-use inversion chair. As with the Stamina Inline chair reviewed above, the IT9910 provides adjustments to fit your height and offers a customizable inversion angle. Sleek and modern in design, this inversion chair sports a bulky look which radiates with a sense of security. Truly, you’ll hardly find an inversion chair that’s more sturdy and stable in construction, but these qualities come with some limitations which we’ll seek to explore. Let’s dive in. Apart from the aforementioned tether strap which controls the inversion angle, the Body Power IT9910 also comes with a safety bar, an ankle-locking system, and a standard lap belt. We should also point out that the ankle lever is adjustable from a seated position. Also, when not in use, you can secure this model with a simple hook that latches onto the crossbar to prevent accidental inverting of the chair. We find this feature a bit unnecessary as it's highly unlikely the chair will flip when motionless but you can never be too safe. Build quality is where Body Power IT9910 really shines. Just have a look at that enormous construction. True, this will mean more time spent assembling the unit and storage limitations, but still, much can be said about the benefits of such a design. Made of heavy, 2-inch steel tubing and flat stock steel, you can rest assured the IT9910 will last you for a long time and won't jiggle an inch when in use. Plus, it can withhold up to a staggering 300 lbs due to such a solid structure and the whole unit is foldable meaning you won't find it too difficult to put it away in a corner when not in use. But don't let the heavy-duty materials hold you back thinking you'll feel discomfort or won't be able to relax while inverted. On the contrary, all upholstery, as well as handles and ankle bars, are padded with thick foam to ensure maximum comfort. Because of its excellent value for money and high demand, the Body Power IT9910 is often out of stock. The price tag which isn't the lightest but won't exactly burn a hole in your pocket either doesn't truly reflect the plethora of great features this inversion chair packs. If you're after a hefty inversion chair which won't break after a few months of use, the Body Power IT9910 offers impressive specifications. It may be a little elaborate and robust but it does the job perfectly fine and its clever design allows for convenient storage and superb comfort and stability. Another gem from the stellar exercise equipment brand Stamina is the Seated Inversion Chair. If the Inline is too bulky for your fancy, this sleek, modern-looking alternative makes for a great addition to your home gym. Invert in style with up to 300 lbs weight limit and an array of exciting features we’ll explore below. Hopping in and getting off this Stamina inversion chair is a breeze. In fact, we can say with confidence this product offers outstanding usability all-around. The ratcheting leg-locking system is superb and allows you to securely hold and release your ankles via the push-button lever. As to be expected, the lap belt is adjustable too and so is the inversion strap which offers a very generous angle. A nice touch is the inclusion of rubber floor protectors which enhance your safety and stability when the chair is in use. We're immediately drawn to the Stamina Seated Inversion Chair's attractive design but past the pretty looks hides a heavy-duty frame providing decent durability and security. The footrest turns the inverting experience into a touch more comfortable one while the handlebars on each side make it easy to mount and dismount the chair. Lastly, we have to mention the padded upholstery and foam-stuffed ankle bars set to soothe out any discomfort of your inversion session. As for the price, there is no doubt the Seated Inversion Chair is an upscale product which you'll have to set aside a bit more dime to get your hands on. Still, if the quality is what you're looking for, this product won't let you down. 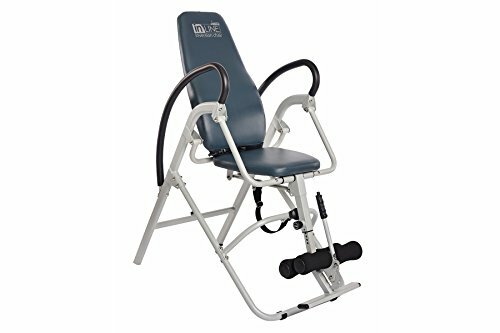 With all that being said, we can conclude the Seated Inversion Chair by Stamina is set to complement your home gym as a viable tool for all your inversion needs. It's well-built and sturdy but above all it is extremely easy to use. All these qualities justify the somewhat steep price and make it a great choice for all inversion enthusiasts. Now that you’re updated on the best inversion chairs money can get in 2018, here are some additional factors to bear in mind when trying to narrow down your quest to a single product. In other words, what’s the design like? Is it too complex and difficult to maneuver? Or does it make for a great user experience? You’re likely scouting for a perfect inversion chair in your search for the simplest inversion tool around. And that’s why you need to give its design substantial forethought. A feature-rich product will make a world of difference when it comes to ease of use and effectiveness. Inspect the chair for features such as an ankle-locking system, adjustable straps that allow for a decent inversion angle, textured handlebars, etc. The last thing you want to end up with is an inversion chair that doesn’t fit you and isn’t adjustable. You know what they say – safety first. It should go without saying your inversion chair should have an adjustable lap belt and preferably some sort of a safety locking system that prevents inversion past the desired angle. Pay attention to weight capacity as well. If you’re of bigger build make sure the chair can withhold your weight to stay on the safe side. Always check the frame of the inversion chair you’re considering is made of a heavy-duty, quality material. You want to keep your chair as stable, lightweight, and durable as possible. Don’t cause further pain to your back or neck by inverting in a chair that’s uncomfortable. Ensure there’s sufficient padding on all components where your body makes contact with the chair. This most often includes upholstery, handlebars and ankle bars. You may also want to think about the size of your inversion chair. How long is the assembly going to take? Is it going to fit where you planned to store it? In the case your answer is no, is it the product foldable and thus easier to put away? Seems like a no-brainer but you’d be surprised how many folks end up with an oversized inversion chair with no place to stash away. Obviously, the price is going to play an important role in your decision-making process and you should definitely stick to your budget. But keep in mind it’s worth saving a few extra bucks for a product that’s going to last and prove to be a good investment down the road. Apart from the aforementioned factors you should be aware of, make sure you’re buying from a reputable brand. Not only will you have a peace of mind the manufacturer will stand behind their promises, but you’ll also know your product comes from a maker that has honed their craft in the industry. Health Mark is a seasoned maker of inversion tools and equipment and a brand you can fully trust when it comes to inversion chairs. Based in Acworth, Georgia, this manufacturer has been going strong for quite a while and you can rest assured in the quality of their products. Stamina hasn’t grabbed two of our round-up’s spots by accident. A pioneer in the inversion niche, Stamina has been delivering high-quality home gym products since its inception in 1987. Today it has cemented itself as a big name in the industry and offers a wide range of products and an exceptional customer service. Body Power is a global fitness brand which offers quality inversion products at an affordable price. Famous for their superb line of inversion tables, Body Power continues to trail its path in this relatively unknown industry with widely-revered inversion chairs. Indubitably the biggest name in the inversion world, Teeter’s range of inversion products has amassed widespread acclaim. Still, the company hasn’t launched any inversion chairs as of yet and we’ll keep our eyes peeled to their newsletter for new updates. 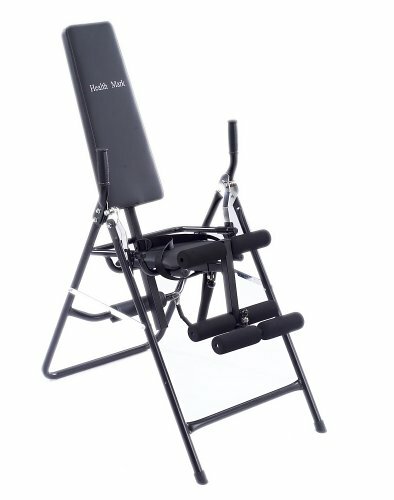 Certain inversion tables from this brand are among the best on the market. Check out our list of the best inversion tables this year has to offer here. Now, if you’re riddled with back pain and are looking for a safe and prompt relief, your top concerns should be decent stability and adjustability options. Another thing you’ll want to have in mind is usability. A chair that’s easy to get in and out of makes a world of difference when you’re trying to minimize back pain. Excessive sitting causes a plethora of health problems, including chronic back pain. The leader in our roundup, Health Mark IV18600 Pro Inversion Therapy Chair fits the bill just right. It’s extremely easy to use and the plethora of functions and adjustments within your hand’s reach allow you to configure the chair per your needs, so that you can completely relax while inverted. Consequently, this product scores remarkably well when it comes to tension relief and spinal decompression. The Stamina Inline Inversion Chair makes a great alternative, too. You’re able to quickly adjust it how you want and decompress your spine with maximum comfort and stability granted by padded components, durable frame, and skid-resistant floor protectors. This means less jiggling and shaking which can sometimes intensify the user’s back pain. However, in recent years, we managed to befriend chairs and grace them with a few upgrades. We added a lever here, a handle there and now we use them to bolster our health and even treat some of the conditions caused by the traditional chairs. We’ve created a fitness tool that’s simple and straightforward to use, allowing us to enjoy the benefits of inversion therapy with minimum discomfort. Meet inversion chairs. Also called gravity chairs, anti-gravity chairs, or inverted chairs, these are basically chairs that allow you to assume an upside-down (inverted) position. And considering most of us are unable to pop into a few-minute-long handstand and don’t want to pressure our ankles and joints, an inverted chair comes in handy as an excellent alternative. There are multiple ways to practice inversion therapy. Some are less challenging and quite straightforward, other require a certain level of physical strength and stamina. What’s so great about inversion chairs is they put the least amount of pressure on your body and for this reason alone are very appealing to many people. You simply get yourself seated while inversion chair starts rotating as you lean back, securely strapped in its seat. You’re then able to get the same amount of traction as you would with an inversion table, only it’s a lot easier to use them. Some folks tend to confuse inversion tables for chairs and often think they’re the same. Perhaps this is because inversion chairs are not as well known or popular as other inversion tools on the market are. In any case, the two are quite distinct and we’ll outline their difference a bit later on. Broadly speaking, we can group inversion chairs into two of the following types: models which flatten as soon as you begin inverting and those which keep the user seated throughout the inversion process. The former products are easy to get in and off and look a lot like inversion tables when in use. With them, you are able to perform a near full inversion without the need of being in great physical shape. The latter inversion chairs usually feature a built-in knee support bar and typically don’t rotate by more than 70 degrees. Still, they provide just enough traction needed for spinal decompression and other benefits of inversion therapy. And as with every fitness tool out there, inversion chairs come in a plethora of styles, material, and with a wide range of features. Some are more easily adjustable, some complex in design. Others will sport a minimalist design while there will be ones with more features that you will possibly need. There are even models which are a hybrid of inversion tables and chairs, combining certain elements of both. To find and compare some of the very best inversion chairs this year has in store, head over to our dedicated guide where we’ll try to help you pick the one that suits your needs and budget the most. It is also worth noting that, when compared to their rival inversion tools, chairs are relatively scarce on the market. Still, there are enough to get lost in the variety of choice. And of course, it goes without saying the price range can vary quite wildly, too. There will be extremely affordable inversion chairs and then some that will burn a hole in your pocket. We cannot say for sure which one of these two inversion tools is better for you without taking into account your personal circumstances. Indeed, those who are in ideal health and don’t suffer from any medical issues might be better off with an inversion table as they won’t find it difficult to use one. Plus, because of their soaring popularity, inversion tables are a lot more abundant on the market and come in a plethora of different styles and variations. If you’re after fancy features such as heated padding, adjustable lumbar support, or massage function, inversion tables have it all covered. If you’re keen on learning more, give a read to our best inversion table guide. We’ve outlined some of the very best product the market has to offer. However, anyone struggling with mobility or suffering from knee, ankle, or hip pain will find inversion chairs a lot more suitable. For example, an older individual who’s considerably out of shape will most likely favor gravity chairs to any other inversion tool on the market, primarily for their ease of use. In other words, gravity chairs are hard to beat when it comes to comfort, support, and stability. So, to come back to our inversion chair vs inversion table duel, the answer to which product is better relies solely on your own situation. What’s so great about inversion chairs is their ability to take a lot of stress off your body which renders them extremely convenient for many people who struggle with related conditions. You’re not only able to get in and get off an inversion chair with ease, but once you’re strapped to the seat, the pressure is evenly distributed across your body instead of being anchored in your ankles, knees, or pelvis. What’s more, inversion chairs allow you to move your torso more freely. You’re even able to lightly stretch and twist in an upside-down position, adding a bit of a kick to your standard inversion session. For advanced users, there are chairs that even make working out on them possible. But that is not to say standard inversion therapy doesn’t come with enough benefits as it is. Both of these tools allow you to decompress your spine, thus improving circulation between the vertebrates and reduce muscle tension, fatigue, and lower back pain. How to Use an Inversion Chair? Because inversion chairs are essentially redesigned inversion tables, the process of inverting on both is not worlds apart. What makes inversion chairs simpler to use is the fact you’re starting out in a seated position, instead of a fully stretched one. Most models will come with a leg-lock system and an adjustable belt that goes across your lap. Make sure you make use of both before inverting. Only when you’re securely seated in place should you start leaning back. As you rotate and the chair starts to flatten, hold onto the handles to ease your progression. These will come in handy when it’s time to go back into the initial position as well. Finally, most inversion chairs let you control how far you go back. Some models feature an adjustable strap that sets the angle, others have a lever that locks the mechanism in place. Either way, make sure you start with a moderate angle. You want to let your body adapt to the practice of inverting before moving on to more demanding positions. Should You Consider Buying One? If you’re looking to try inversion therapy and enjoy the multiple benefits this practice brings along, then the answer is yes. Even more so if you’re lacking mobility or are suffering from chronic pain and physical injuries. Man suffering from chronic back pain. This is usually the main reason why people prefer inversion chairs to tables, boots, or swings. The ease of getting in and off combined with the evenly distributed weight makes these products incredibly secure and straightforward, which certain people find invaluable. However, because inversion chairs are often out of stock we encourage the more advanced users to look into other inversion tools. You can find out more here about gravity boots or inversion swings. Still confused as to what inversion chairs are and how to use them? Here we answer some of the frequently asked questions. 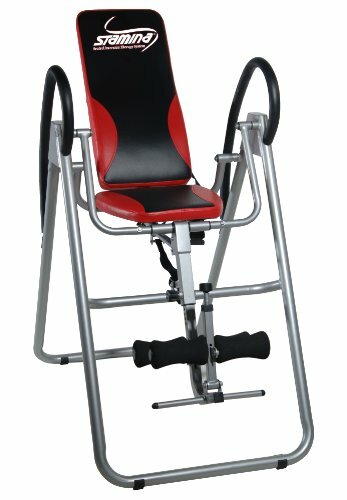 How do I use an Inversion Chair? Get yourself seated in the chair and secure the lap belt so that it holds you comfortably yet tightly in the position. If needed, make adjustments in advance to the leg-locking system and the inversion angle. Then, gently lean back and start inverting. We recommend you begin with a modest angle of no more than 30 degrees at first. You can progress to more challenging angles once your body gets adjusted to an upside down position. How Long Should I Invert for? The exact length of your inversion session isn’t set in stone. You may be a seasoned practitioner and feel more comfortable with inverting longer or a complete beginner who is taking his or her first steps in this world. In the latter case, you’ll obviously want to start light and work your way up the clock. The time you spend upside down also depends on the degree you’re inverting to. Laying back at a 20-degree angle is a lot easier on the body than a 70-degree angle. With that being said there isn’t a definitive time limit – some users invert for 2-3 minutes while others practice for longer periods of 10 to 20 minutes. Listen to your body and dismount when it stops feeling comfortable. Shorter periods divided into several daily sessions work better than a single, lengthy session. Which Angle Should I Invert at? The answer to this question depends on you. If you’re just starting out and are a beginner invertee, we recommend you go for a mild angle of about 20 to 30 degrees. After a couple of weeks, you can progress to a more challenging angle and work the chair to its maximum. When will I start to Notice Benefits? It varies. Some users feel the benefits straight away while for others, it can take several weeks to kick in. The most important thing is to relax and allow your body to adapt to this new practice. The rewards will follow. How Much Space Will my Inversion Chair Take? This very much depends on the particular model we’re talking about. Some chairs, such as the Body Power IT9910 are rather bulky while others come in more modest dimensions. Make sure to prepare enough space beforehand and don’t forget to account ceiling, furniture, and bystanders in. How Many Times per Day Should I Invert? Remember that frequency is the key with inversion. Practicing several times per day in shorter intervals is more beneficial than inverting for longer periods of time but once per day. Is it Normal to Feel Dizzy? At first, especially if you dive into the practice too quickly, you may get off your inversion chair feeling a little dizzy. This is nothing unusual, after all, all your blood is rushing down to your head and is then being forced back to your body when you dismount. But just because the blood is rushing doesn’t mean you have to as well. Keep your movements gentle and give your body some time. Are my Ankles 100% Safe? Can I Move when Inverted? Yes! In fact, gentle movements and stretches while inverted are highly recommended. But, kicking back and relaxing is fine, too. Whatever works for you best. How Does an Inversion Chair Relieve Back Pain? When in an upside down position, your body benefits from spinal decompression among other things. This is because pressure between your vertebrae space is reduced significantly when you invert. Simply put, as your spine stretches and aligns, your nerves have more room to breathe and thus don’t spark as much pain. Can I Injure Myself While Inverting? In addition, by not giving your body the time to adjust and overdoing an angle, you are risking dizziness and disorientation once you’re back to normal. Are Inversion Chairs Suitable for Senior Citizens? Inversion chairs are one of the easiest, if not the easiest, inversion tools out there. Therefore, elderly members of the community are encouraged to use them so long they don’t fall into the category of people who should avoid inverting altogether. Inversion chairs allow senior citizens to step into the world of fitness. Are Inversion Chairs Difficult to Assemble? As with other fitness tools, you’ll need to free up some time for assembly. Certain models will be easier to put together while others may be a little more complex. As a rule of thumb, the process shouldn’t take more than an hour. Make sure you follow the manufacturer’s instructions closely and leave no screws behind apart from the spare ones.